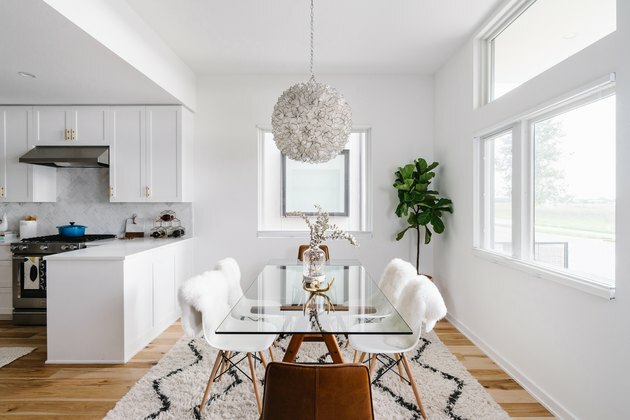 When designing the home she shares with her husband and six-month-old son, Christine Turknett of Breathe Design Studio wanted to create a cozy and calming space that still felt contemporary. 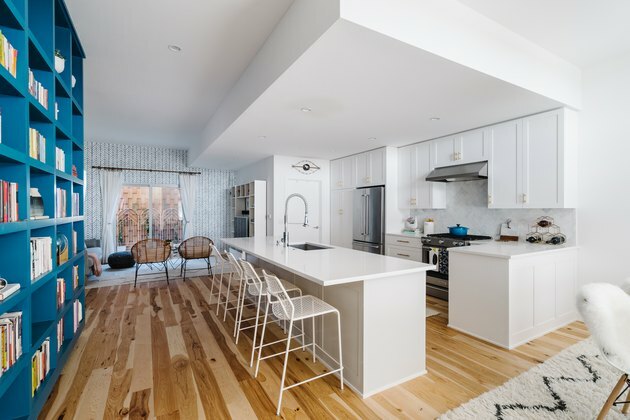 "I decided that 'modern farmhouse' would guide our decision making so we could warm up the space while incorporating the fact that the home is located in Texas," she says. The home is located in Austin's Mueller neighborhood, a new development on the site of the former airport, and was a custom build, which allowed Turknett to select everything from the flooring to the design of the shampoo nook in the shower. Turknett balanced the cool palette of whites and blues with warm hickory pecan floors. Soft textures, including sheepskins, woven poufs, and a Moroccan rug, also add to the relaxed vibe. The finished space is colorful yet calming, cozy yet crisp: everything a modern farmhouse should be. 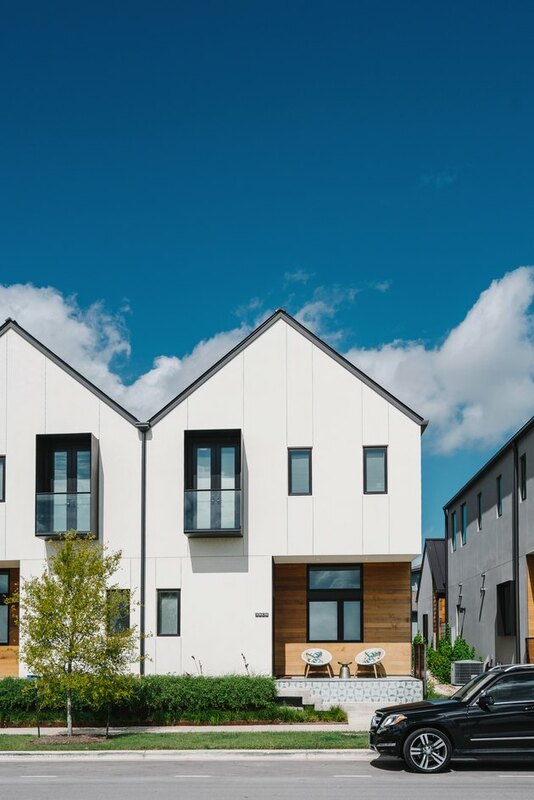 Turknett and her husband customized this modern rowhouse in Mueller, which was designed by Austin architect Michael Hsu. The wood-paneled front patio contributes to the farmhouse feel. 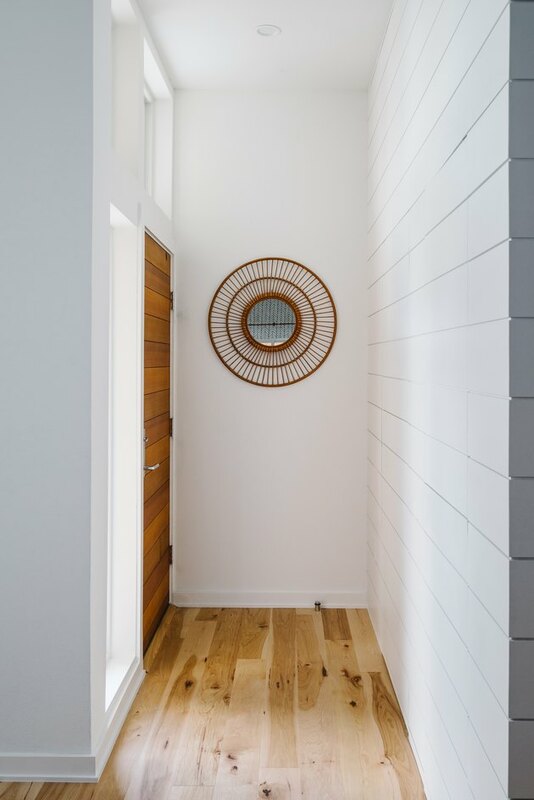 A custom pine tongue-and-groove accent wall and a rattan mirror from Target give the entry a rustic feel. Serena & Lily wallpaper and paintings by Lola Donoghue liven up the living room. 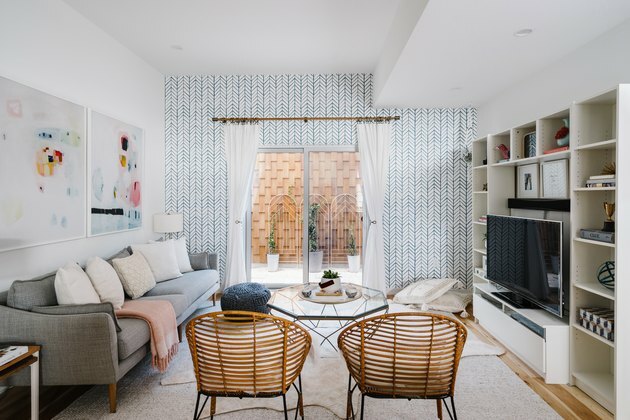 The space has plenty of seating, from floor pillows and a knit pouf to a West Elm sofa and Target chairs. Cozy sheepskins warm up Eames chairs in the dining area. An Anthropologie pendant hangs above the West Elm table. Turknett chose Shaker-style cabinets in the kitchen for their farmhouse feel and modernized them with brass hardware. The custom pine bookcase is painted in Sherwin-Williams' Georgian Bay. 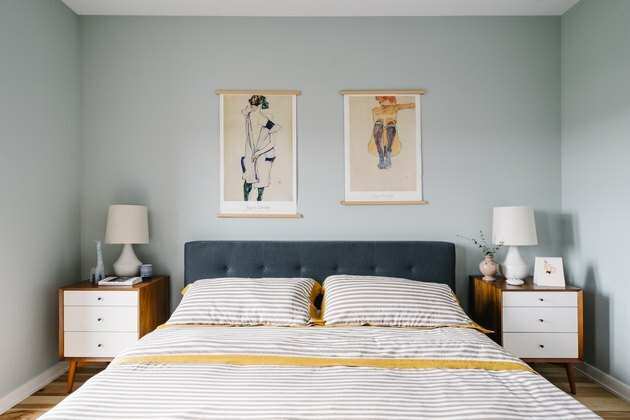 Egon Schiele prints are displayed above the Crate and Barrel bed in the master bedroom. The different sized prints break up the symmetry of the room. 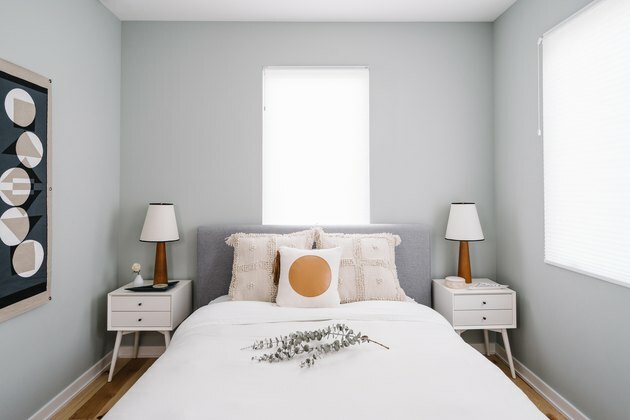 A guest bedroom was decorated in shades of white and gray. "It was important for me to keep things within a cooler palette, so I chose colors with blue undertones," she says. 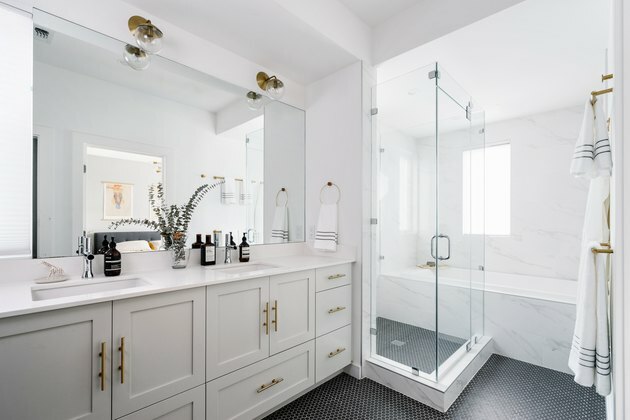 For the master bath, Turknett chose graphite hexagon tile for the floors, which vibe well with the marble accents and cabinets painted in Benjamin Moore's Gray Owl. 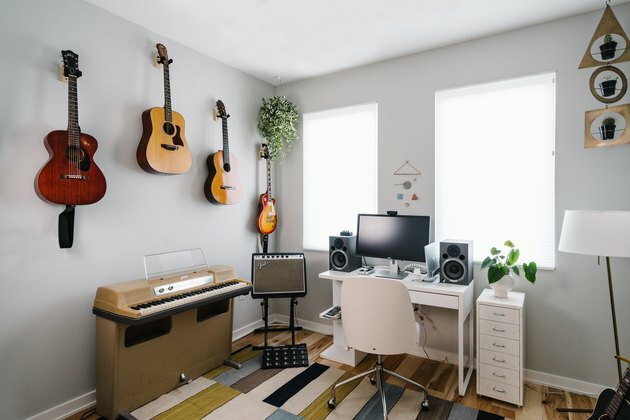 The office and music studio is home to a vintage Wurlitzer keyboard and a collection of guitars. An Ikea desk and rug from Design Within Reach complete the space. 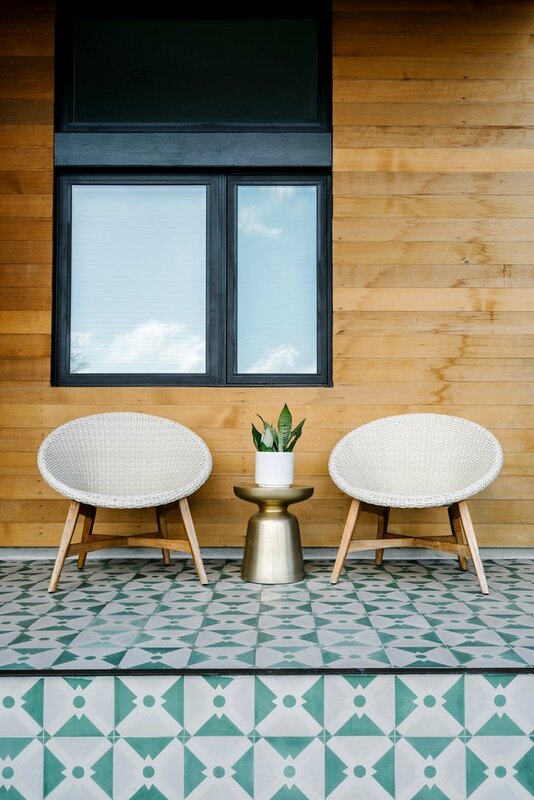 Colorful concrete tile was chosen for the front porch, which features chairs from World Market and a table from West Elm.